Thanks to my new (temporary) full-time self-employed status, today was a busy day spent running around, putting art up and bringing ideas to fruition! Don’t you just love days like that? Urban Retreat Salon Spa in Vancouver, WA. 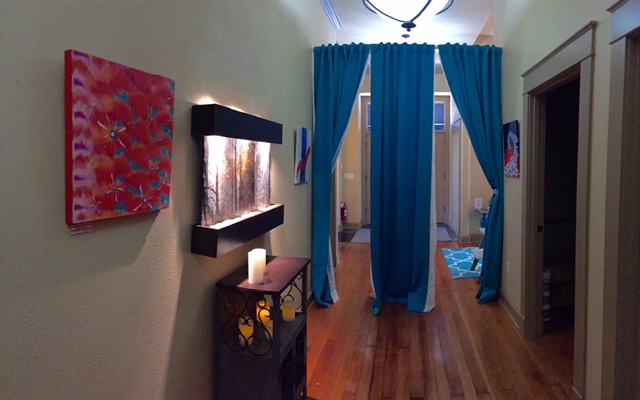 I drove up to Vancouver, WA to install a few paintings at Urban Retreats Salon Spa, located at 12504 NW 36th Ave. The ambiance there is so calming, I think I’ll have to trek back up there to check on the paintings and prints and throw a facial in there too. The staff is sweet and friendly, and the environment is perfect for art. A selection of paintings and prints will be available there through the holidays. 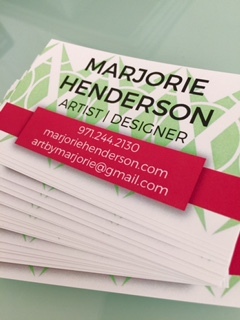 After updating the website, I decided I needed to update my business cards. I’m always trying to perfect the image and feeling I want my site and business collateral to portray, and I think I finally have something that conveys my optimism and colorful view of the world. I love them! A big thanks to all of my supporters, my site traffic has had a significant uptick this week! Thanks for sharing my blog and my art with others on all the various social media platforms we have out there, particularly with Facebook and Instagram, it’s been awesome connecting with other artists that share the same passion for their craft!